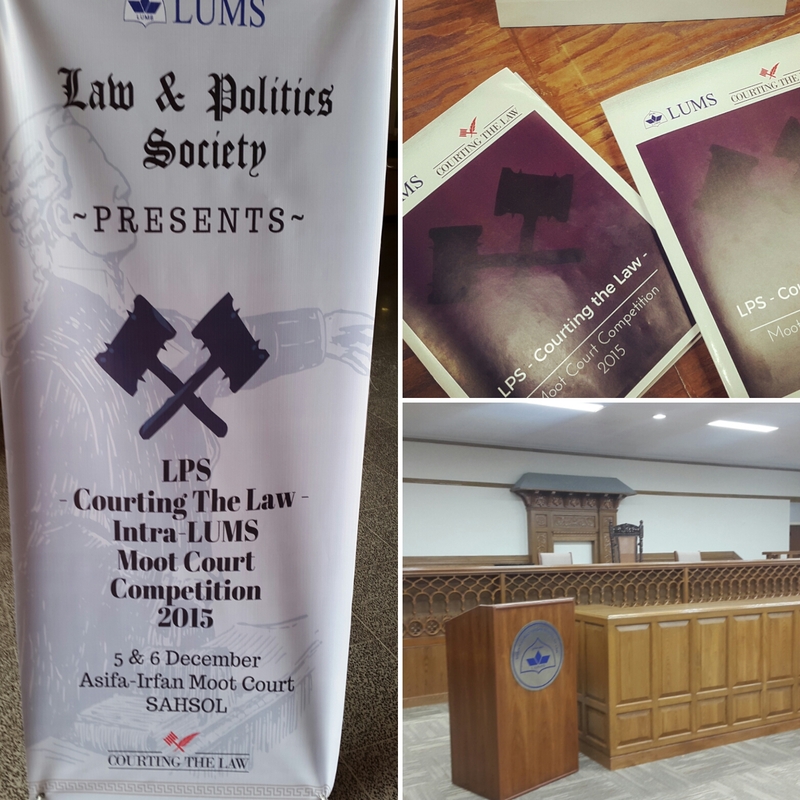 The LUMS Law and Politics Society, in pursuance of its objective to inculcate a vibrant mooting culture in the legal academia of Pakistan, organized a unique two-day intra-LUMS Moot Court Competition. The competition was sponsored by Courting The Law, Pakistan’s first legal news and analysis portal. Ten teams participated in the competition which commenced with preliminary rounds on December 05, 2015. Many renowned Judges, lawyers and legal academics such as Justice(r) Aamir Raza Khan, Saad Rasool, Saroop Ejaz, Ali Sultan, Zafar Kalanauri, Saqib Jillani, Harris Azmat, Ali Ibrahim and Asad Jamal graced LUMS with their presence as judges of this Moot Court Competition and provided the participants with insightful remarks. Participants advocated for the appellants as well as for the respondents and strived to present the best arguments possible in favor of their respective clients. Most of the debates were centered upon the constitutionality of this Ordinance and the appellants challenged it on the touchstone of fundamental rights recognized by the respective constitution. After some intellectually stimulating matches in the preliminary rounds, four teams qualified for the semifinals and then ultimately the finale was held on December 06, 2015, in which Umair Ahmed – a sophomore at LUMS – secured the final trophy. The runner-up team included Abeer Anjum and Amina Khalid who are currently enrolled in the final year of the BA-LLB program of LUMS. The closing ceremony, hosted by Nimra Arshad, was held on December 06, 2015 in which Justice (r) Aamer Raza Khan, former Chief Justice of Lahore High Court, awarded prizes to the finalists. Afterwards, Uzair Kayani, patron of LUMS Law and Politics Society briefly addressed the audience and then proceeded to distribute shields as humble tokens of appreciation to the honorable judges who graced the competition with their presence during the competition. Efforts of the organizing team, especially the members of LPS Executive Council including the President Khadijah Ahmad, Vice President Zariya Mushtaq and Convener Moots Sheza Ahmed were duly recognized and appreciated by the patron of the society towards the closing of the ceremony. He appreciated Courting the Law for encouraging and supporting law students in organizing such activities. The Grand Finale was followed by refreshments in which participants interacted with the judges and their peers to exchange insights from mutual experiences. The Law and Politics Society at LUMS is determined to organize further similar events in order to provide students with a platform to polish their advocacy and research skills by engaging them in debates and mooting activities.